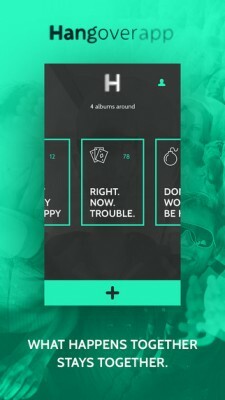 HangoverApp lets you create photo albums that are only viewable when the people in the photos are in the same physical space. The internet today is not a private place. Everything you do is tracked and almost everything is hackable, pretty easily. While there are plenty of things that trick us into thinking that our communications, for example, are private — down to the language we use to describe the tools, i.e. “private message” or “direct message.” The reality is that privacy is in short supply online. So I’m always happy to hear about a new app that helps people take back some of that privacy that we’ve all so willingly given up over the past few years. HangoverApp is one that uses location to ensure privacy in one area that we definitely all need it: photos. Here’s how it works. When you want to make a photo album, all you have to do is invite your friends to join you — after you’ve all downloaded the app, of course. They’ll see the invite and request to join. Once you have all of the friends you wanted to be involved, you can lock and save the album and get started snapping pics! Five minutes after any of the members of the album leave the area, the album will lock and the photos will disappear from everyone’s phones. They’re only accessible when everyone is in the same space again – which makes them great for everything from parties that you’d really rather didn’t end up on Facebook, as well as photos of a more, ahem, personal nature. No one can access the pics unless you’re all in one place on HangoverApp, so there’s no need to worry about them ending up in public places.